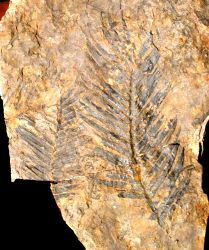 The leaves of these extinct plants resemble those of the Cycas group very much, but there is no (or only a very distant) relationship. 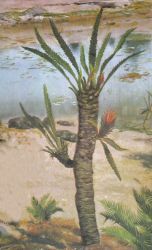 The Bennettitales were large plants, from about 50 cm up to 2 meter. The special character is that they had 'flowers' (with a petiole). 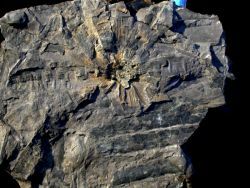 Like the Caytoniales the Bennettitales have been thought to be early angiosperms, in other words that they were ancestors of the modern flowering plants. In this case it also turned out to be untrue. 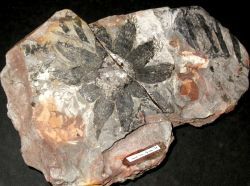 The flowers in the Bennettitales and the angiosperms have evolved independently. A difference between the two kinds of flowers is that those of the Bennetitales didn't have pistil (ovary, style, stigma) and stamens. Sometimes it is difficult or even impossible to distinguish the species of the Bennettitales and the cycases without making a cuticle preparation. 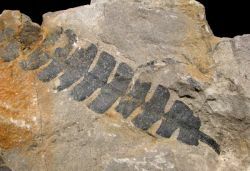 The cells of the epidermis in Bennettitales plants have often very crinkled walls (see below), whereas those of the Cycadales have straighter walls. Meanwhile scientists have found out which flowers or parts of flowers belong to which plant species. Below are some examples. A complicating factor is that several flower parts have their own names. The reason is that the discoverers didn't know how matters stood. Some of the flowers were unisexual, i.e. 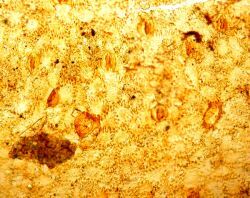 they produced only male or female reproduction cells, others were dioecious. A very common species is Nilssoniopteris vittata. This plant has elongated, undivided leaves with a rather long petiole. Sometimes large surfaces are covered with these leaves (mostly parts of them). 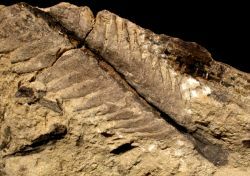 By exception the leaves are still incised at the base. Click on the photo on the left. In a microscopic slide of the cuticle of this plant the crinkled cell walls are very obvious. The stomata are also visible. Click on the photo on the right. The flower of this plant is of the Williamsoniella type, a dioecious one. A complete flower is a rarity: the surrounding sterile and male scales have generally fallen off. In this way the photo on the left shows the female part of a flower. The male bracts were sitting as a kind of floral leaves around the female heart of the flower. A female centre of a flower without male scales has even got its own name: Bennetticarpus. Is is not quite certain that these flower parts really belong to Nilssoniopteris vittata. There are also other species with Williamsoniella type flowers. Click on the photo on the left for more information. Willliamsoniella flowers were attached high on the trunk between the leaves. An important and, especially near Whitby and Hayburn Wyke, common Bennettitales plant is Zamites gigas. The photo on the right shows a nearly complete leaf from the Whitby Plant Bed. The leaf has a striking resemblance to a Cycas leaf but it isn't. The structure of the cuticle is very different. Click on the photo. The flowers of this plant are unisexual. Williamsonia gigas (click on the photo on the left) is the female flower and Weltrichia sol is the male. We haven't find the latter. The protecting, but detached scales of the flowers are called Cycadolepis. 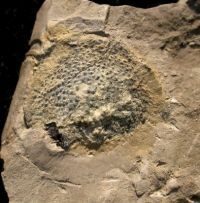 The genus Otozamites is also a member of the Bennettitales (click on the foto on the right). The leaflets of these plants have a widening on the upper side of the base. Zamites doesn't have such a widening. Sometimes cuticle preparations are needed to distinguish the species. On the left is a photo of the male flower of this plant, Weltrichia spectabilis. The fine specimen is displayed in the interesting museum of Whitby. Anomozamites nilssonii is characterized by the rectangular, almost square leaflets (photo on the right). The border of the leaf is very fine dentate, because of projecting veins. Those veins are one time branching and this is a difference with Nilssonia compta, which has unbranched veins. The plant occurs in the Gristhorpe Plant Bed. More bennetitalian species are known from this area, but this is what we have found. 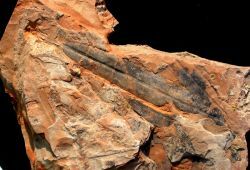 The Bennettitales formed a substantial part of the flora.